A last minute take on the VivaLasVegaStamps October challenge. 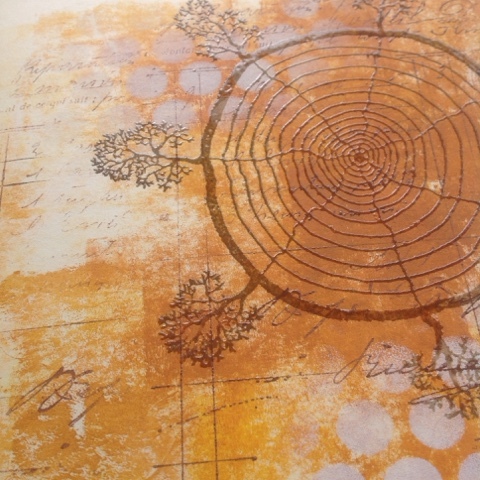 I've chosen the warm orange- browns, polkadots and trees from the moodboard. I was planning to use the above sentiment too, but don't have space for it, so I'm leaving this as it is. I'm also posting for the Simon Says Stamp challenges Wednesday (Anything goes) and Monday (Throwback, I chose the 'Love this technique' from September. P.S all my unmouted stamps are completely unmounted, I have an acrylic block with "TacknPeel" that I usually use for stamping. 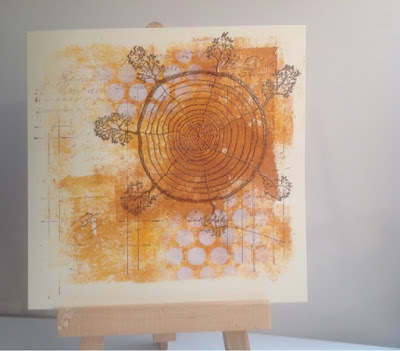 The tree circle is too big for that, but I had my gelli plate out (I like to roll the paint on that before going on the paper, got a gelliprint, too) and realized that the unmounted stamp stuck nicely to the gelli plate that sits firmly on a large acrylic block. Fabulous card Kristina! The background you've created looks fabulous. This is a great interpretation of our challenge over at VLVS! Thanks for joining us..
Fabulous creation for the VLVS challenge! this is awesome, great texture!